Less than a week ago, President Macron was lambasting Italy for signing agreements with China in the context of their New Silk Road, alias President Xi Jinping’s Belt and Road Initiative (BRI), in the same breath he was criticizing China for attempting to undermine Europe with new trade individual country deals under the pretext of BRI. However, Italy, also scolded by Brussels for her single-handed deals with China, was, in fact, the first G7 country for signing a number of contracts with China to use Italian ports under the BRI, making Italy also the first official EU partner of China’s BRI. In response to the explosive yellow vests (gilets jaunes) movement, French president Emmanuel Macron announced the “Great Debate” – a vast, unprecedented nationwide exercise in consulting citizens on how to fix France’s problems – starting in December 2018 and ending this March. 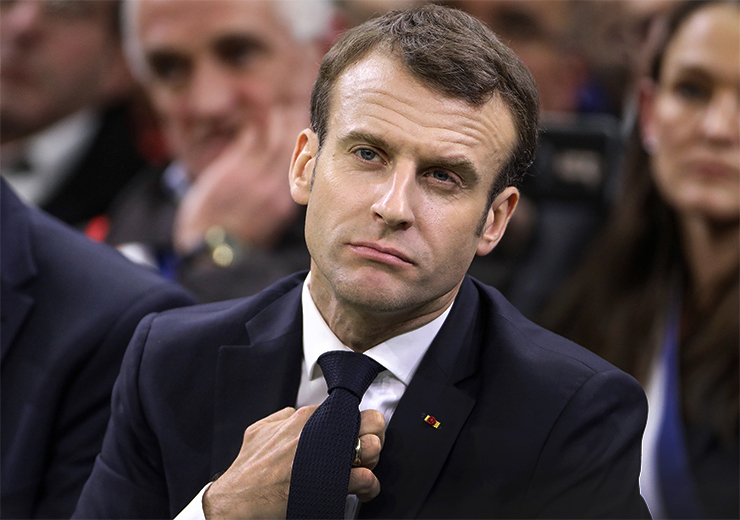 Attempting to shore up his legitimacy and dampen contestation, Macron travelled the country engaging in lengthy debates with locally elected mayors. With his tour ending on 15 March, the yellow vests flocked to Paris, ransacking the Champs-Élysées and joining in two other large, simultaneous protests: one for climate justice, the other against state racism and police violence. In 1934, the political situation in France was tense and uncertain. The year began with a mobilization of royalist and fascist militias (on February 6) that were followed immediately (on February 9 and 12) by a response from the Communist and Socialist wings of the workers movement. As Norbert Guterman and Henri Lefebvre reported, “all these men are ready for the concrete liberation a revolution would bring – and perhaps also, unfortunately, the mystique and brutal mythology of the fascists” (1999 , 143, trans. SK). When these lines were written in the mid-1930s, France was experiencing a rising tide of grassroots anti-fascist politics culminating in the strike waves of the early days of the Popular Front government. Yet Lefebvre and Guterman’s warning was well-placed. The Popular Front disintegrated due to many contradictions, ultimately giving rise to Marshall Pétain’s collaborationist administration, France’s contribution to fascist regime politics. At the very moment when in Paris the lower house was voting to implement Macron’s proposed laws designed to suppress public demonstrations (a legal right protected in both the French Constitution and the U.N. Human Rights Declaration) tens of thousands of their constituents were out in the streets all over the country demonstrating and striking against Macron’s authoritarian, neo-liberal government. The demonstrators’ demands ranged from better salaries and retirement benefits, restoration of public services, equitable tax codes, an end to police brutality, and banning the use of “flash-balls” on demonstrators, to Macron’s resignation and the instauration of participatory democracy. The French National Assembly voted overwhelmingly on Monday to approve President Emmanuel Macron’s “anti-riot” law, undermining the right to protest and further expanding police powers. Far from dying down after the holidays, France’s yellow vest movement is continuing to blaze throughout the country. Every Saturday for eleven weeks, protesters have been disrupting or blocking roads, traffic circles and freeway toll plazas, gathering in the squares of villages, taking to the streets of towns, marching in massive numbers through city boulevards, and confronting violent police repression. Ten people have died in the protests, mainly due to accidents at road blocks, and over 2000 have been injured by the police, around 100 seriously. 17 people have lost an eye due to rubber bullets, according to an independent association and an investigative journalist, while the interior minister recently said there were 4. Thousands have been arrested. PREFACE The video below is an eloquent document about the clashes of Gilets Jaunes with the police. The anger of the demonstrators is obvious, there’s pent-up frustration with a regime they perceive as deaf and dumb to their interests or the institutions of genuine democracy (sound familiar?). The video —a collage of various clashes and possibly different dates—focuses on a great deal of violence, but Gilets Jaunes “acts” (as they call them) are mostly peaceful. Do not—despite these images—yield to the notion the Gilets are a bunch of irresponsible “casseurs” (guys just out to break senselessly everything in sight). Their cause is just. But notice as well that these are people who are not easily intimidated. There’s something to be learned from the French here, in how they tell the ruling cliques that they won’t be taken for granted. Except for the top video, all the rest reflect events occurring between January 19 and 20. In What Is To Be Done of 1902 Lenin opposed revolutionary spontaneity because it “strips away the disciplined nature of the Marxists idea of revolution, leaving it arbitrary and ineffective.” True to himself, Lenin then returned to opposition to spontaneous revolution after WWI during the German Revolution of 1918-19 when in a spontaneous uprising against the post-WWI system Rosa Luxemburg and the Spartacist League failed in an attempt to overturn German capitalism. In a series of actions this past week, the government of French President Emmanuel Macron has intensified police-state repression aimed at crushing “yellow vest” protests against social inequality. For Thierry Meyssan, one of the consequences of the successive ends of the bipolar and unipolar world is the re-establishment of colonial projects. One after the other, the French, Turkish and English have publicly declared the return of their colonial ambitions. We still need to know what form they will adopt in the 21st century.